Japan was again the top-performing whisky region on the secondary market. Prices for Port Ellen stood still while the Macallan price rally came to a full stop. Here is the second part of our round-up for the year that was. In the first part of our 2018 Annual Report we found out that while the market keeps on growing its composition is ever-changing. Releases without age statements gain market shares but it is especially the eldest whiskies which experience continuous price increases. In this second part we want to continue where we left-off last time by having a look at the market composition with respect to the vintage. For this analysis we split the whiskies in our database into seven different clusters according to their year of distillation. 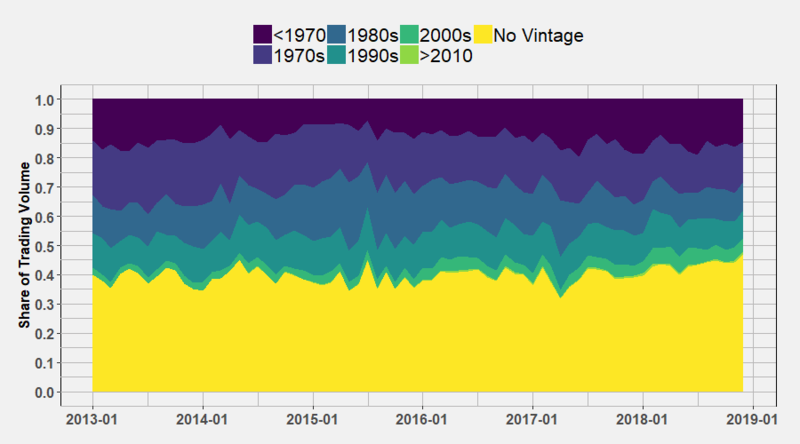 This clusters represent the decades starting from the 1970s all the way to the years between 2000 and 2010 with everything prior to 1970 and everything after 2010 put together into two groups. Additionally there are those releases for which there is no official information about the year of distillation. First we visualize the market shares with respect to the sheer number of traded bottles. Back in early 2013 about the half of all traded bottles did not bear any vintage information. Over the last six years this changed. In the second half of 2018 this share stabilized at around 60% and above. 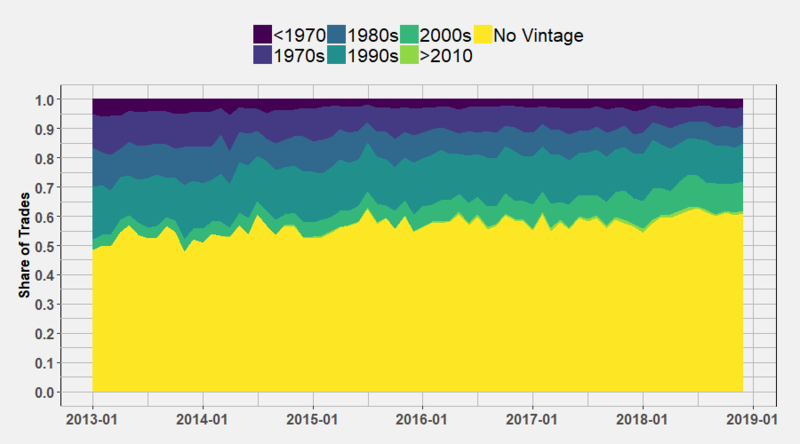 So over the course of the last couple years the market share of “no vintage” releases increased by around 10 percentage points, which perfectly aligns with the market increase of NAS bottlings which we saw in the first part of our report. Naturally the younger vintages of the current millennium increased too as more and more of these whiskies reach the “optimal” maturation time. Also quite intuitively is the fact that the relative share of the very old vintages decreases over time. By the end of 2018 only about 7% of all bottles traded were distilled in the 1980s. Six years ago it was 10% and more. In this second visualization we measure the market share by the prices paid for these whiskies. Obviously the picture changes as the old vintages tend to be the expensive ones. Nowadays the pre 1980 vintages only account for roughly 10% of all bottles traded but at the same time for 30% of the money that is spent on auctions. We also see that for the pre 1970 vintages this figure increased from 10% in 2015 to now 15% at the end of 2018. At last we also take a look at the median prices that are paid for these vintage clusters. And no surprise here, it is the old vintages which experienced the highest price increases. In 2013 half of the pre 1970 vintages traded did so for less than 400 Euros. 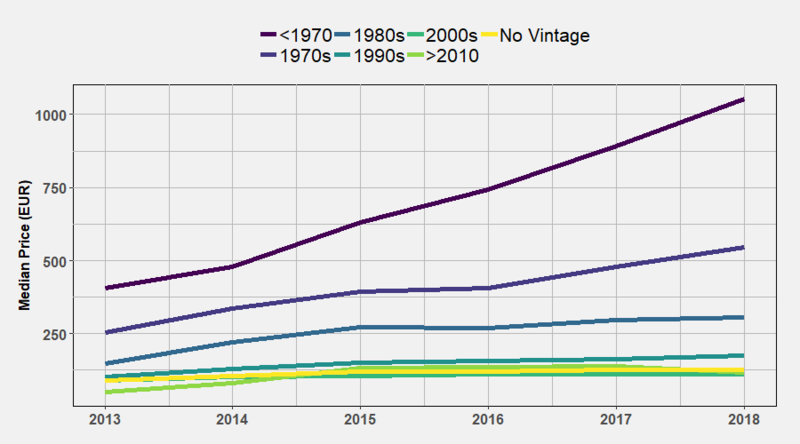 Until 2018 this median price has more than doubled as 50% of all pre 1970s vintages now trade for more than 1.000 Euros. The other decades follow accordingly. Our chosen method for summarizing the secondary whisky market as a whole are our major market indices. You find a detailed explanation of these indices in our description. 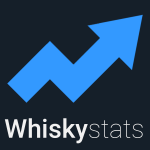 The Whiskystats Whisky Index (WWI) summarizes the change in value of the 500 most traded whiskies each month. In 2018 the WWI was off to a great start as it gained around 6% within a single round of auctions. What followed was a two month setback from which the market recovered quickly as the WWI gained more than 14% from April to October 2018. In the last quarter of the year it seems like prices consolidated again and our major market index finishes with a total 7,8% annual return. 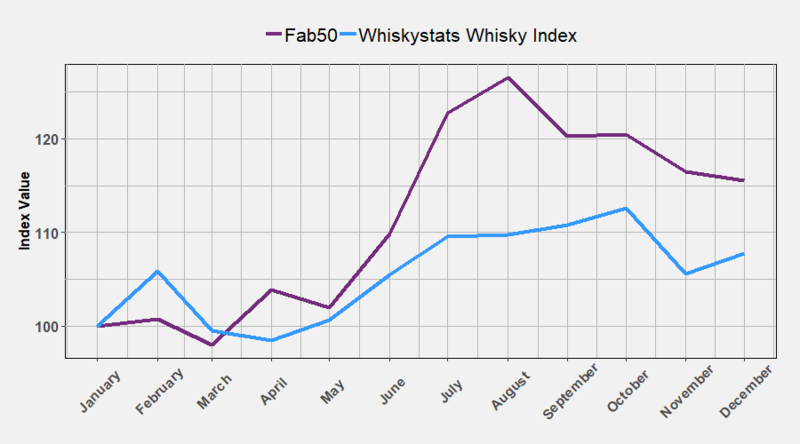 The Whiskystats Fabulous Fifty (Fab50) are a collection of 50 iconic releases for which we can track the value all the way back to early 2013. During the course of 2018 our Fab50 collection experienced a massive increase in value as the total collection worth went up by 26% from January to August 2018. In the closing months of 2018 prices decreased again. Nevertheless, our Fab50 collection closes the year with a 16% annual return! The overall market movements we described above can now be broken down into the major whisky regions. Similarly to the indices above we scale our region indices to the value of 100 in January 2018 to better compare their movement during the year. Quite obviously the prices for japanese whisky gained momentum again as our Japan index climbed by 35%. We also see that the February 2018 hiccup of the above displayed WWI was mainly caused by Islay bottlings. 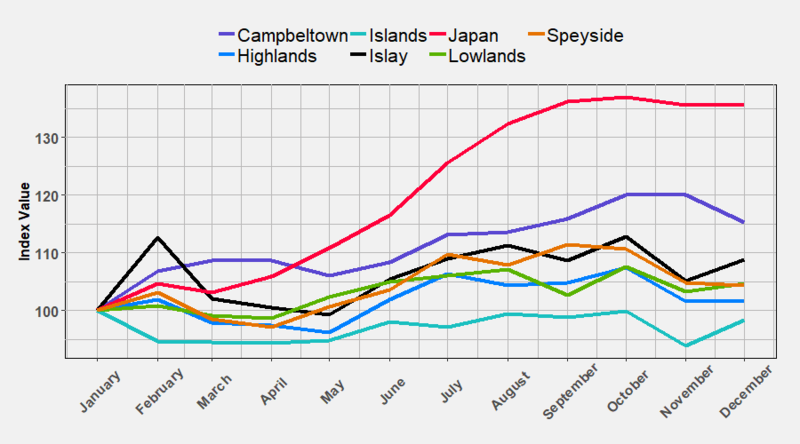 The second best performing whisky region of 2018 is Campbeltown. Until October 2018 the most traded Campbeltown releases gained 20% in value. All other region indices closed the year with an annual performance of 2% to 9% with the exception of the Islands. The most traded Island releases even lost slightly in value during the course of 2018. We also see that the November round of auctions brought decreasing index values for almost all of the regions. So the drop we saw for the WWI was not a region specific but a general one. To drill a bit deeper we now turn our attention to the distillery indices. We here focus on the top distilleries of our distillery ranking. Again the respective indices were scaled to 100 in January 2018 to better compare the movements. There we see that three distilleries clearly separate themself from the others as their indices gained more than 30% within a single year. These are Yamazaki, Rosebank and Karuizawa. Together with the also strong performance of Hanyu this perfectly explains the movements of the Japan region as a whole. So it is Rosebank which is the best performing scotch distillery of 2018. 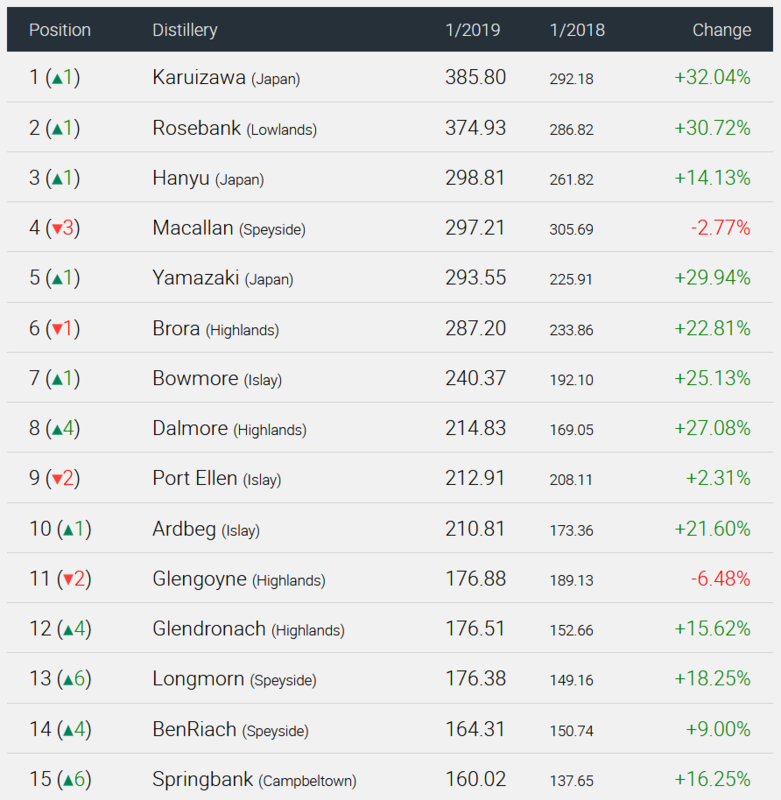 Our Longmorn index gained almost 20% which translates to the second place among scotch distilleries. 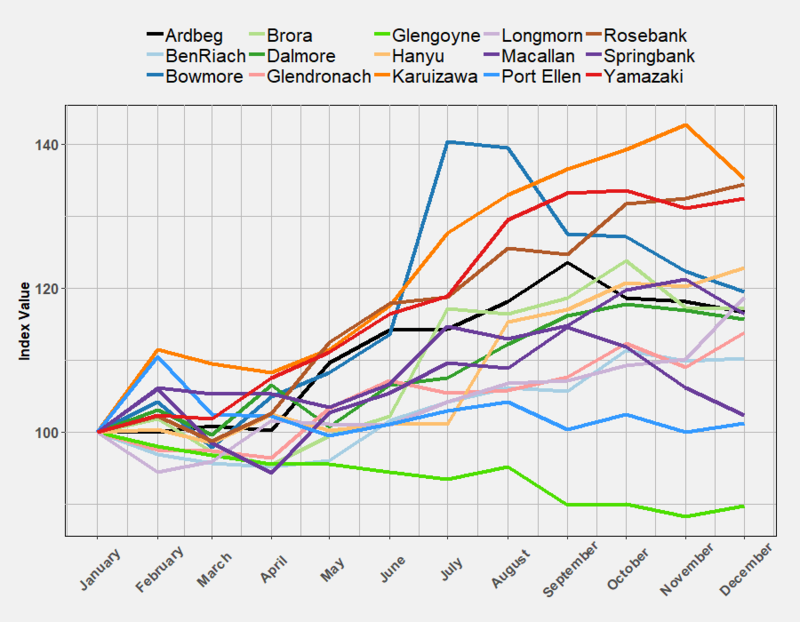 The Bowmore index had a massive jump in July but lost ground ever since. At the bottom we find Glengoyne which lost almost 10%. Also quite interestingly is the fact that our Port Ellen index did not move much at all. Seems like prices for Port Ellen leveled in, at least for the time being. In below table we summarize the index movements from January 2018 to January 2019 and added the ranking (and change in rank) accordingly. So Macallan started the year of 2018 as the prime distillery on the secondary whisky market. During 2018 it lost this status however, even falling from the podium as Karuizawa, Rosebank and Hanyu took over. Among the top ten distilleries we observed very strong performances, often beyond 20%. Beside Macallan it is only Port Ellen which does not follow these scheme. The most traded Port Ellens roughly gained 2% in 2018. Springbank also had a very strong year by gaining 16% and thereby entering the top fifteen of our ranking. The secondary whisky market never sleeps as new price observations drip in every month. The early auctions of 2019 saw some of the above observations changing already. For example, the Macallan index soared-up by almost 7% in February 2019 while Port Ellen continues to lose ground. And then Rosebank even overtook Karuizawa to now top our ranking. To keep updated make sure to follow our monthly price updates! Bound by history, separated only by a single street crossing. The Brora and Clynelish distilleries just ask to be compared. This is why we have a closer look at these two Highland scotch whisky producers and their history on the secondary whisky market. This topic contains 0 replies, has 1 voice, and was last updated by Whiskystats 3 weeks, 5 days ago.